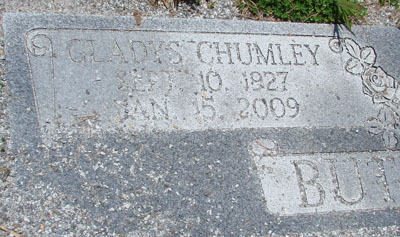 Gladys W. Chumley, daughter of Jasper and Sallie Chumley, wife of Sylvanis Butterworth. 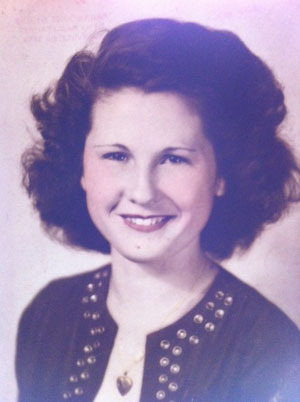 Gladys W. Butterworth, 81, of Acworth, died Friday, January 16, 2009. Funeral services will be held at 2:00 Sunday afternoon in the Hillcrest Baptist Church with the Rev. Paul Vance and the Rev. Hal Cole officiating. Burial will follow in the Old Macedonia Cemetery. Mrs. Butterworth will lie in state at the church for 1 hour prior to the funeral. 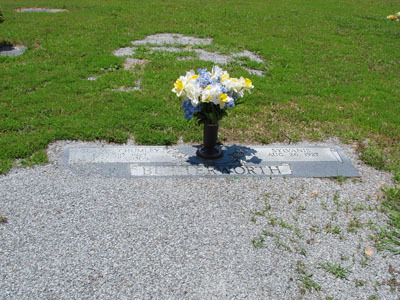 She is survived by her husband, Sylvanis Butterworth of Acworth; daughter, Peggy Travis of Cartersville; son, Wayne Butterworth of Anniston, AL; grandchildren, Jennifer Maddox of Harvest, AL, Tracy Braden of Oxford, AL, and Kristie Wade of Woodstock; sister, Mae Smith of Acworth; brothers, Curtis Chumley and Lanier Chumley both of Acworth; Several nieces and nephews also survive.